Last week’s release of the trailer for Stephen King’s The Dark Tower movie just about broke the internet, with fevered and passionate discussion about just how right or wrong the director had got things. Widely recognised as the most important of King’s works, The Dark Tower series is a ridiculously huge tale, with nearly 4300 words in eight novels, written over the course of 30 years. Simply put, it’s the story of Roland, the last gunslinger, who is working his way to the Dark Tower to take down the Crimson King. He is pursued by the man in black. As a longtime Constant Reader, I have spent much of my grown-up life reading and rereading Stephen King novels. My bookshelves are full of scary clowns, weird alien invasions, alcoholic hotel caretakers and needful things. I own all the books, have seen all the movies, and have definite thoughts on best and worst novels. I’ve downloaded the reading maps, sought out the editorials, and even fallen in love with the works of his son Joe. Every reader who has a favourite author can feel nervous when books are turned into movies. And it must be said that King’s movie adaptations can vary wildly in success, from the heady heights of The Shawshank Redemption and Stand By Me, through the disturbing Misery, to the adorable but kind of dorky 1408, and the downright embarrassing Langoliers. So you will understand when I say that I am not alone right now in feeling VERY nervous about the upcoming release of two of King’s most well-loved works. The trailer for It was released a few weeks ago, and in less than 3 minutes managed to scare the pants off most of the western world. I have yet to watch it without covering my eyes every few seconds. And the Dark Tower trailer is mesmerising for different reasons. How can one movie even begin to show us a world that is described not only in the eight Tower books, but also appears in countless other of his tales, from The Talisman, to Insomnia, to Black House, The Stand and The Shining and more. There’s totally no time to go back and reread the whole series before the movie is out, and King has already told us that this particular story is not one of the original ones from the novels, but another of Roland’s journeys. So all I have to do now is sit, and wait, and like countless other Constant Readers, hope that this movie is at least good, and hopefully great, that Roland Deschain is a true gunslinger and that the man in black is every bit as dreadful and mesmerising as he is in the books. And try to figure out if I will EVER be brave enough to watch IT. Last night I sat in a beautiful room and listened to a fabulously sung tale about serial killers. I was a bit nervous that the live opera performance wouldn’t measure up against the recent Tim Burton movie, which was visually stunning and starred the always-brilliant Helena B-C, as well as badly-behaved Johnny Depp. Sometimes when you’re watching a live show and there’s lots of singing, it can be hard for people who don’t know the story (or the songs), but Opera Newbie reported that he pretty much followed the lot. And the set was gorgeous. Deceptively simple, but with lots of different clever bits that moved in mysterious ways. The lighting was almost a star in its own right, too, with atmospheric fog and really effective spotlights making things look darn scary quite often. 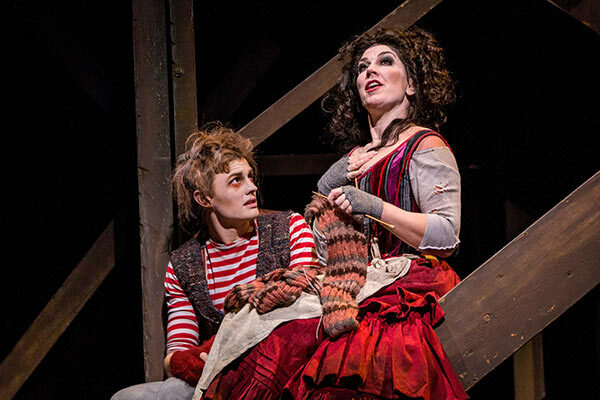 My favourite character in any of the different versions I’ve seen is always Mrs Lovett, and last night was no exception – Antoinette Halloran’s voice, acting, costume were all fabulous, and I totally have a fangirl crush on her. I’m also finding myself humming bits of her songs, and vaguely thinking that this weekend I might try making some pies. 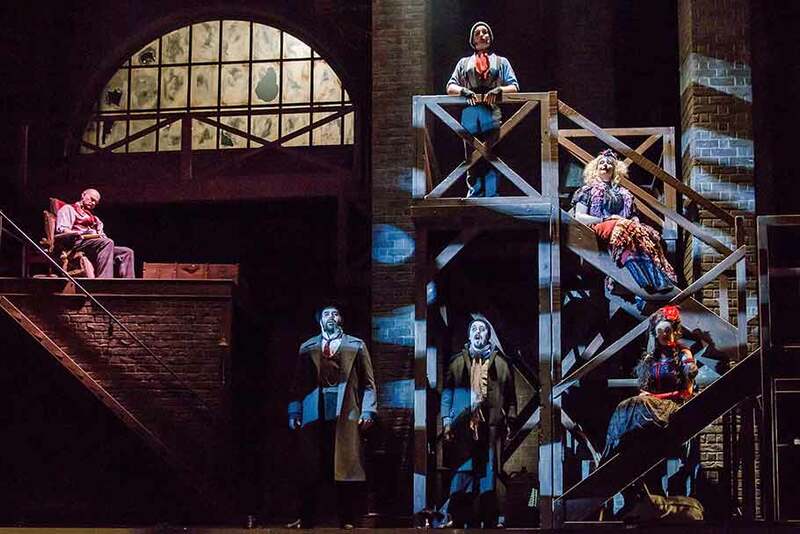 More about NZ Opera’s production of Sweeney Todd at the Isaac Theatre Royal, 12 October to 15 October. I have a friend who’s never been to the opera. Never been to a musical. Actually, possibly never even been to a live theatre performance before. 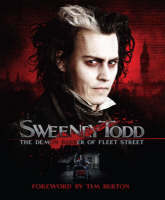 How exciting for him, then, that his very first outing to all of the above will be to Sweeney Todd: the demon barber of Fleet Street. He looked a little concerned when I told him where we were going (the oh-so-beautiful Isaac Theatre Royal), and for what purpose. Things got worse when I tried to give a brief plot outline. Perhaps I shouldn’t have started with a line about hairdressers. How though, does one cover all the important bits, without spoiling the plot twists? Do I talk about wives and daughters, justice and revenge, haircuts and close shaves, meat pies and unrequited love? Do I mention that Mr Todd first made his appearance over 150 years ago, in the pages of a “penny-dreadful” publication? That there have been more than a dozen different stage and screen adaptations, including the most well-known current movie version starring the now infamous Johnny? Or that Christchurch is the third of the major centres to have the privilege of showing us what a close shave really means? Perhaps I should just send him to the library to read/watch/discover all our Mr Todd-related resources? Perhaps that last one, yes. No doubt like many of you, I grew up learning French at school. For seven years I practiced saying helpful phrases like Ouvre la fenêtre; and Il y a un autobus. 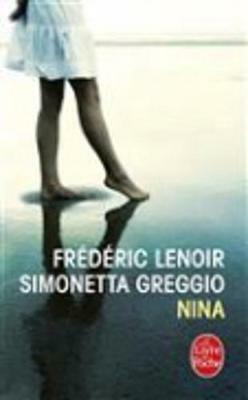 I must have enjoyed it, because I then chose to study French at university. As a consequence, decades later, I can fake the BEST French accent, order coffee authentically, and pronounce the word croissant like a pro. My early exposure to French language and culture has also, however, left me with an enduring love for all things Gallic. 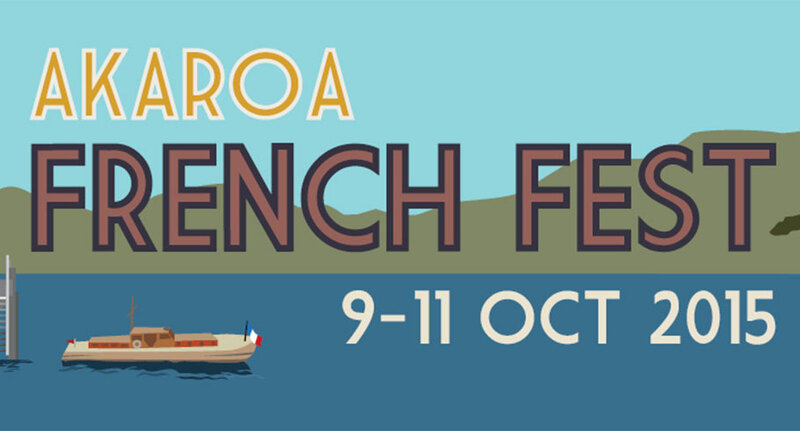 So Akaroa’s biennial French Fest – happening this year from Friday 9th to Sunday 11th October – is a celebration I would very dearly love to attend. Malheureusement, I will be away that weekend, so I will be relying on all of you to do your best to pop over the hill and join in the celebrations. And there’s a lot to celebrate – this year marks the 175th anniversary of the first organised European settlement. You can choose to mark the occasion by attending Friday night’s Fête des Lumières Street Party, or watch the following morning’s re-enactment of the landing of the settlers from the French ship Comte de Paris. Saturday also offers Le Jour du Marché, with a street market at the showgrounds, and on Sunday you can join in (or just watch!) a game of Ki-o-Rahi – a traditional Māori ball game played by two teams on a circular pitch that was taught to the French settlers. As an added bonus, French Fest has this year partnered with Beca Heritage Week, and has the honour of offering the very first event in that festival’s programme. So much to see and do! Je suis jaloux that you will be able to attend – perhaps as a small favour I could ask you to bring me back a croissant, or possibly even pain au chocolat. It seems that in the early days of our city’s European history, it was very much the fashion for visiting luminaries to make a progression through the country, stopping at every town to meet the locals and be wined and dined. 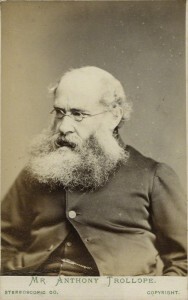 Anthony Trollope, who turns 200 this year, was one such celebrity, and passed through New Zealand in August 1872. 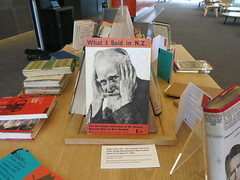 He notes in a book about his travels that he visited every county and province except Hawke’s Bay. 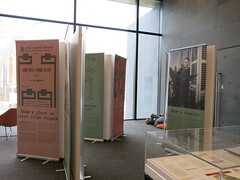 You can trace his journey through the country in Papers Past, a treasure-trove of archived newspapers dating from 1839 to 1948, although there is surprisingly little in the press about his visit to Christchurch – he seems to have arrived and left our city without much fuss at all. This is in contrast to some of his other appearances: he “and wife” attended the Queen’s Birthday Ball in Wellington; was the subject of a great deal of heated discussion around who was paying for his visit, and whether this payment was impacting politically on his writing; and disappointed Dunedinites by failing to attend a celebration of the anniversary of Sir Walter Scott, at which he had promised to speak. Reed’s book is well worth a read, if only to find a reason to feel self-defensively patriotic. 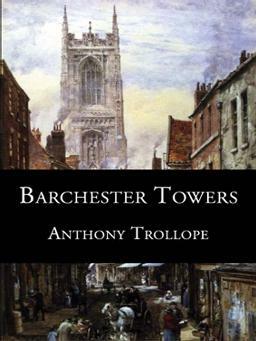 And if you don’t feel like a bit of flag-waving, there’s always Trollope’s fabulous works of fiction to pick up and enjoy. I met Sir PTerry the same year I met my future husband. It was 1985 and I was 18 years old. I have, it seems, spent my entire adult life with him. Which may explain why I am very thankful that I have today off, and am sitting in a darkened room and erratically weeping-while-laughing. 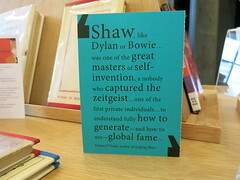 I’m not sure I can do justice to the man – there are people all over the world who write much more betterer than me, and who cared just as passionately about him. You can (and should) read all of these things on the interwebs. 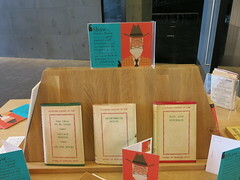 You also can (and should) read all of his books. All I can do is say, thank you – you made me laugh, and cry, and fall in love, and feel brave, and learn things, and re-evaluate the way I thought about things, and champion books that (at least in those early days) no-one else thought were worth a damn. I almost preferred it that way – I think I didn’t want to have to share, and it felt so very special when I met those few others who felt the same. When you came to Christchurch and I got to ACTUALLY meet you, you were every bit as scary and amazing and inspiring as I’d hoped you would be. I fell in love with Vimes. 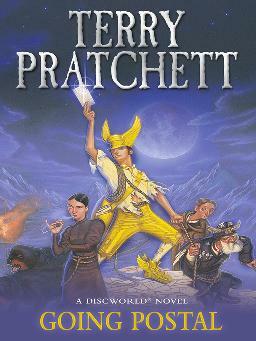 I wanted to be like Granny Weatherwax (but always knew I was probably a lot more like Agnes Nitt). I adore the Patrician (One Man One Vote). We temporarily borrowed a cat called Greebo. I will ALWAYS want to own a dragon called Errol. I have read all of your books; even the slightly less-outstanding very early ones (and those ones by you and Mr Baxter that I didn’t like so much but read anyway, because YOU’d written them). I’ve read them on planes and trains and boats, and in the garden and the lounge and in bed and at work. I’ve read them out loud to my family, and to my friends, and occasionally to random strangers. 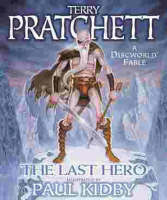 I think my life would have been an emptier, colder place without you, Terry Pratchett. I probably wouldn’t have been a librarian, and I certainly wouldn’t have been a writer of small silly things. You have made me a better person, and I can’t believe I have to carry on in a universe where you no longer are. 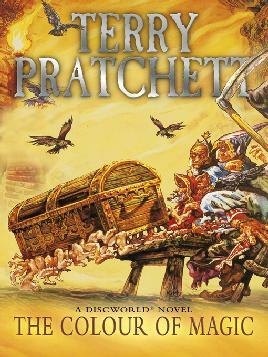 The Daily Pratchett on Twitter: Daily quotes from the Discworld novels by Terry Pratchett. 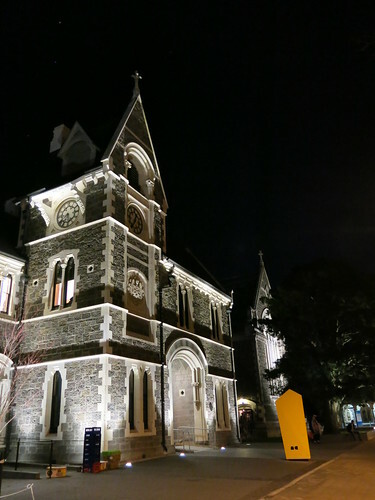 With a capacity crowd at the aptly-named Legends Lounge on Monday night, the amazingly over-talented Kathy Reichs kept the audience at The Press Christchurch Writers Festival event well entertained. Missy T and I arrived early, and it was just as well, as the room filled rapidly with adoring fans both young and old. Most of what she said should have come as no surprise to fans. The questions from both QC Chris McVeigh and the audience were good and she graciously took every lead and followed it well. I’d not heard her speak before, and she looks like one of those frighteningly well-put-together women who manages everything and everyone into submission. She is, however, warm and witty, charming and very easy to listen to. She told stories of life both real and fictional, and I have to say sometimes I forgot whether it was Kathy Reichs or Tempe Brennan we were talking about, which was a bit disconcerting. For those who aren’t as familiar with her work, Dr Reichs is as fully qualified in real life as her main character is in the books, and she always uses a real-life case as the basis for each one of her books (albeit changing all details on the way). She explained that in real life her job is always about answering the same two questions – identity (who is this person? ); and cause of death; and for both of these questions, it’s always about the bones. So what can we tell you that might be new? Contracted to write 19 Tempe Brennan and 5 Virals books, she is currently working on numbers 17 and 5 respectively. The Bones TV series is now in its 9th season, with no sign of slowing down, but as with all TV there are no guarantees. There’s an episode coming up called The Dude and the Dam, which will contain easter eggs – 5 clues from the book Bones of the Lost. Those who watch the episode and read the book will be able to enter an online competition to win stuff. 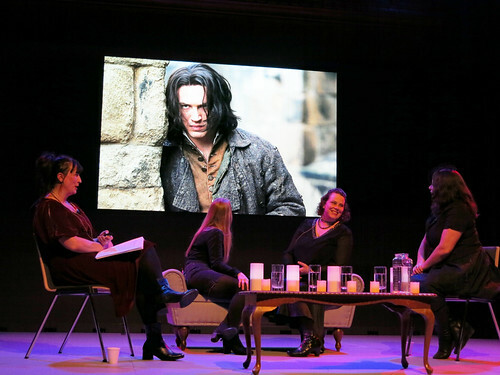 She knows the TV series has a different feel from the books, and gracefully accepted criticism from the audience suggesting that sometimes the show can seem a little flippant and Hollywood-y. 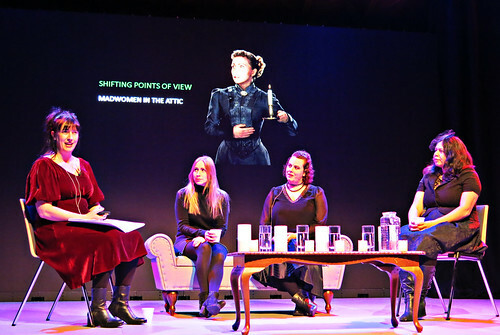 She said everyone can see that the two storylines (book and TV) are different, and for those who are worried by this, it might help to see TV Tempe as being a younger, less polished version of Book Tempe – like a prequel. She really loves working with her kids. She co-authors the Virals series with her son (who has been known to proclaim after a particularly brutal editing by Kathy “Mom, you’re murdering my art!”; and works on the TV series with one of her daughters. Kathy often finds character names by reading local obituaries – if the book is set in a specific town or city, she will read past newspapers from that town and gather names from there. The idea to do the Virals series came about after a conversation with one of her children, who suggested that teens would also love to read about forensics. 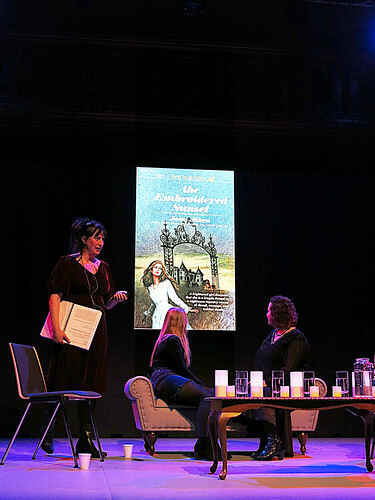 The more unusual aspects of the books (what Kathy calls ‘elements of grounded fantasy’) were added because her publisher noted that teens nowadays seem to be obsessed with the supernatural, and she really didn’t want to do vampires. Or werewolves. So a good night all round, really, with dozens lined up afterwards for what looked like it might be a long wait for book signing. 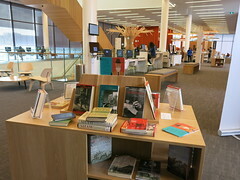 And as always, a great big thank you to the The Press Christchurch Writers Festival team for another sterling event! Having sat staring at a blank screen for nearly half an hour, I am giving up trying to craft a fascinating and alluring blog post on one of my favourite authors ever, and instead I am going to go all infomercial on you. Because if you are already a fan, that’s not going to change and you will have bought your ticket, and we will see you there. If you’ve never read the books, or watched the shows, all I can say is: it’s not too late. Start here, by booking your tickets for the Christchurch event this Monday 23 September 7.30pm at the Addington Events Centre. 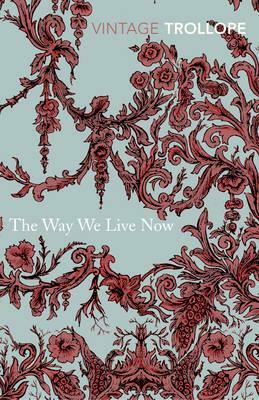 And then (if you’re a fast reader) rush out and find this book. Or if you prefer to read while lying down with your eyes closed, go here for the audio version. Get 3 dimensional with the DVD version of the books – the library now has seven seasons of Bones available. And in the extra-for-experts category, have a look at all the other amazing things we have that deal with forensic anthropology, both fiction and non-fiction. Missy T and I will be spending the weekend writing a list of witty and intelligent questions that show just how fan-girl we are, while also revealing our wide-ranging knowledge on the subjects of forensics, the FBI, serial killers, bone farms, profiling … and wondering how easy it is to switch from librarian-ing to cutting up dead people. 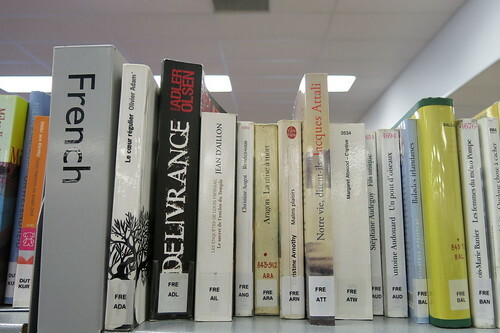 Oh, the serendipitous finds of the new books shelf! 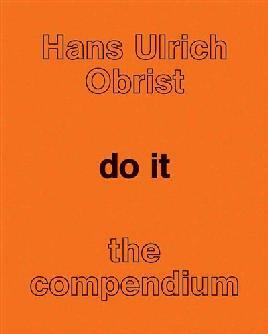 The best thing I’ve found this week (actually, this month; maybe even this year) is a book called do it. 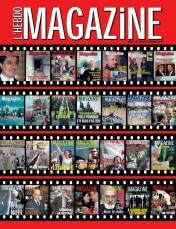 According to the editor’s introduction, this is a ‘collage of beginnings’. The book itself is a collection of works by artists from 1993 to the present, and grew out of a project exploring instructional procedures as an art form. The publisher’s blurb makes reference to “the question of whether a show could take “scores” or written instructions by artists as a point of departure, which could be interpreted anew each time they were enacted”. That’s all a bit arty for me, so I will just describe how I see it: this is a book of instructions by artists on how to Make Art. It’s a bit like paint-by-numbers (and we all remember how cool THAT was when we were kids), but in a grown-up, arty-farty kind of way. For example, Dimitar Sasselov’s A Walk in Our Cosmic Neightborhood (2012) begins “Walk out on a clear evening in November to a dark spot where you can see the stars”, then carries on to detail what stars you should look for, how to sketch them, and what they are called, and ends with the instruction to “Imagine the possibilities”. Michelangelo Pistoletto’s Sculpture for Strolling (1995) is a recipe for creating a metre-wide sphere from daily newspapers (adding one paper a day after reading it). On completion, you are invited to roll the newspaper sphere outside in the streets and the squares as a “sculpture for strolling”. Jonathan Horowitz (Untitled, 2002) offers this: Choose two things that are similar and or different; while David Askevold lays out quite detailed instructions on how to prepare a shrunken head (titled, of course, On Shrinking a Head (2004)). He even helpfully suggests possible clients: “a deceased relative, friend, lover or oneself”. There ‘s a project that begins with satellite TV channels, the Fibonacci sequence, and a digital recording device; and ends with a mosaic that is “… a simplistic representation of one edge of the multifaceted media matrix.” There’s a recipe for making cocaine, one for a cubic metre of bird feed, and one for fried cellular phones.